In this piece "Odalisque" we see a woman in flowing robes, a work of Lord Frederick Leighton from 1862. She is resting in the garden, and is next to a white swan. Leighton's works focuses on an idyllic scene of classical and medieval themes. Here we see a work in classical theme celebrating his love of the study of female characters in a variety of situations in life through various time eras. Here it is a study of an exotic woman which was a fascination of 19th century artists. This is an early work of Leighton and bears his signature of a warm romanticism. 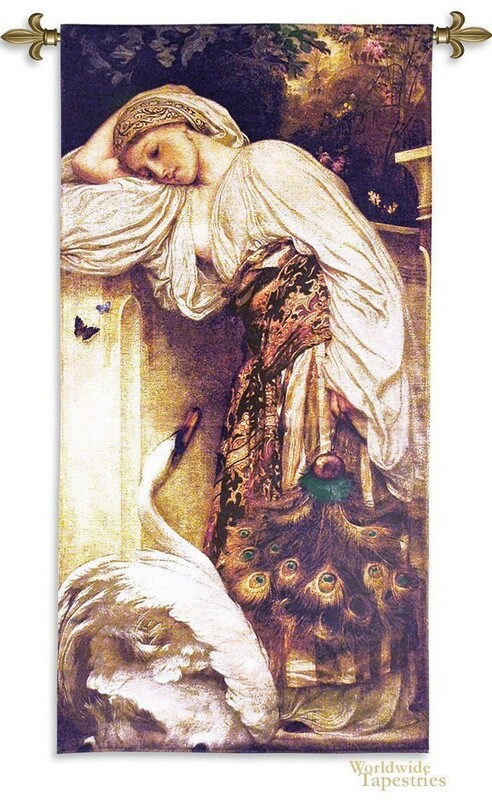 This tapestry "Odalisque" is backed with lining and has a tunnel for easy hanging. Note: tapestry rod and tassels, where pictured, are not included in the price.